Big Mouth House, 9781618731203, 432pp. The Borderlands aren't like anywhere else. Don't try to smuggle a phone or any other piece of technology over the wall that marks the Border -- unless you enjoy a fireworks display in your backpack. (Ballpoint pens are okay.) There are elves, harpies, and -- best of all as far as Elliot is concerned -- mermaids. "Serene," said Serene. "My full name is Serene-Heart-in-the-Chaos-of-Battle." Elliot's mouth fell open. "That is badass." Elliot? Who's Elliot? Elliot is thirteen years old. He's smart and just a tiny bit obnoxious. Sometimes more than a tiny bit. When his class goes on a field trip and he can see a wall that no one else can see, he is given the chance to go to school in the Borderlands. It turns out that on the other side of the wall, classes involve a lot more weaponry and fitness training and fewer mermaids than he expected. On the other hand, there's Serene-Heart-in-the-Chaos-of-Battle, an elven warrior who is more beautiful than anyone Elliot has ever seen, and then there's her human friend Luke: sunny, blond, and annoyingly likeable. There are lots of interesting books. There's even the chance Elliot might be able to change the world. 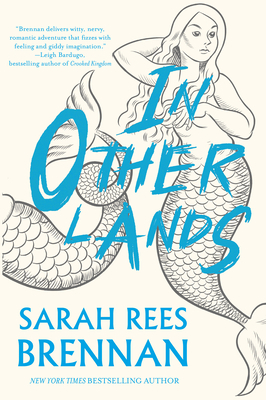 In Other Lands is the exhilarating new book from beloved and bestselling author Sarah Rees Brennan. It's a novel about surviving four years in the most unusual of schools, about friendship, falling in love, diplomacy, and finding your own place in the world -- even if it means giving up your phone. Sarah Rees Brennan: Sarah Rees Brennan was born and lives in Ireland. She is the New York Times bestselling author of Tell the Wind and Fire, In Other Lands, and Season of the Witch (Chilling Adventures of Sabrina), among others.